As I type this, it's 5:00 AM. I'm processing old photo...a sometimes tedious task. It's just not nearly as much fun to process photos as it is to take them, and as a result, I have a backlog of old, unprocessed photos going back over 5 years. As I'm going through them this morning, I got to photos from an Alaska trip in May of 2014, and was pleasantly surprised to find a series of photos of a Bald Eagle, with a backdrop of a volcano! Upon seeing it, I remembered shooting it, but I'd never processed the photo or uploaded it to my website! This was on a drive down the Kenai Peninsula on May 20th, 2014. This is along the east coast of the Cook Inlet, looking westward towards the other shore where mountain ranges and some recently active volcanoes lie. I believe this is Mount Redoubt in the background. A "favorite" photo of mine, but one I forgot I had! 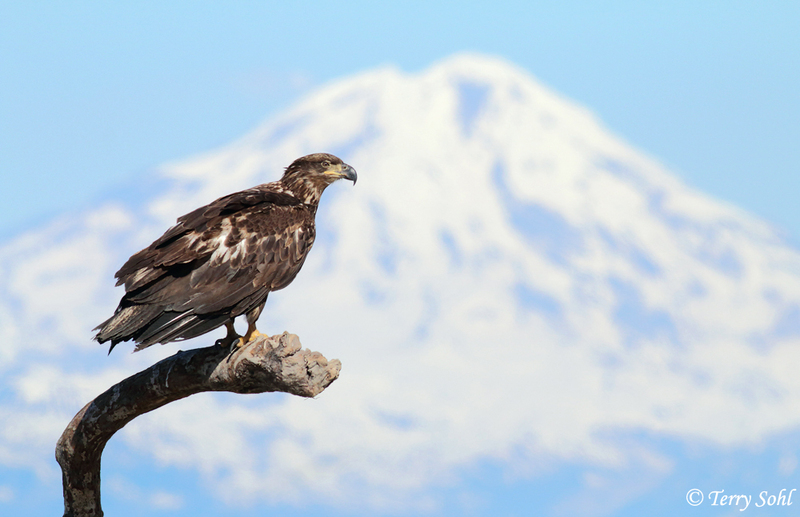 The simple perch, the eagle at relatively close range, framed with a volcano and blue skies in the background...can't ask for more than that!